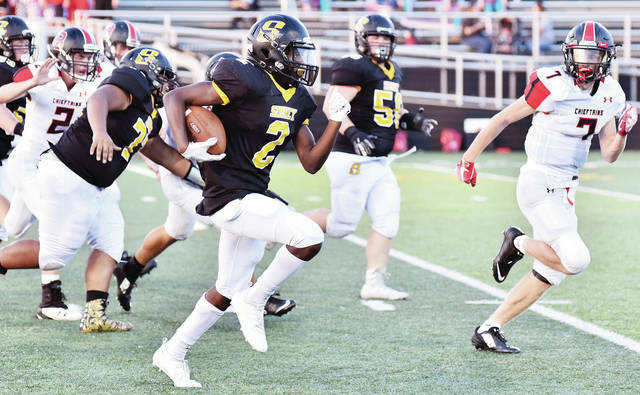 Sidney freshman Quamir “Philly” Brown runs during a nonconference game against Bellefontaine on Thursday at Sidney Memorial Stadium. Taking down Bellefontaine’s Grant Smith are, left to right, Sidney’s Josiah Hudgins, Christian Retterer and Darren Taborn during a nonconference game against Bellefontaine on Thursday at Sidney Memorial Stadium. 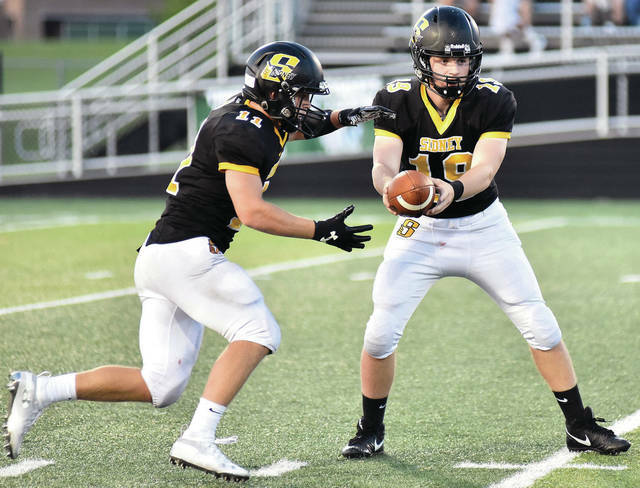 Sidney junior quarterback Ryan Dunham, left, hands off to senior running back Caleb Harris during a nonconference game against Bellefontaine on Thursday at Sidney Memorial Stadium. Sidney senior running back Christian Retterer runs with pressure from Bellefontaine defenders during a nonconference game against Bellefontaine on Thursday at Sidney Memorial Stadium. Sidney senior quarterback Ryan Dunham is wrapped up by a Bellefontaine player during a nonconference game against Bellefontaine on Thursday at Sidney Memorial Stadium. Sidney junior quarterback Ryan Dunham, right, hands off to senior running back Caleb Harris during a nonconference game against Bellefontaine on Thursday at Sidney Memorial Stadium. Sidney senior wide receiver/safety Keith Lee reaches for a pass during a nonconference game against Bellefontaine on Thursday at Sidney Memorial Stadium. Sidney freshman quarterback EJ Davis fights for extra yards while be taken down by a Bellefontaine defender during a nonconference game against Bellefontaine on Thursday at Sidney Memorial Stadium. Sidney senior running back Caleb Harris runs with pressure from Bellefontaine defenders during a nonconference game against Bellefontaine on Thursday at Sidney Memorial Stadium. 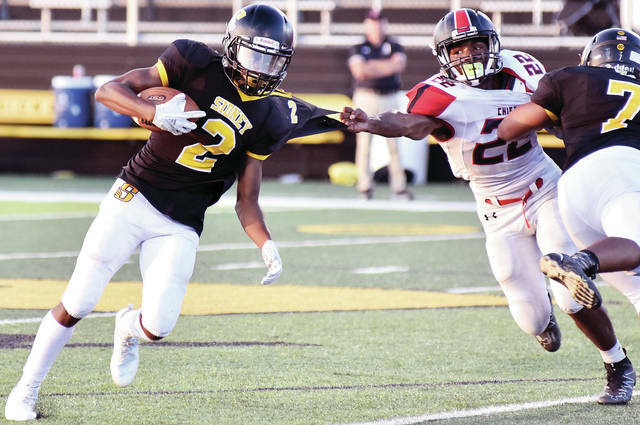 Sidney freshman receiver Quamir Brown runs during a nonconference game against Bellefontaine on Thursday at Sidney Memorial Stadium. Sidney’s Caleb Harris runs while dragging Bellefontaine’s Isaac Williams during a nonconference game against Bellefontaine on Thursday at Sidney Memorial Stadium. View more photos from Bellefontaine at Sidney here. 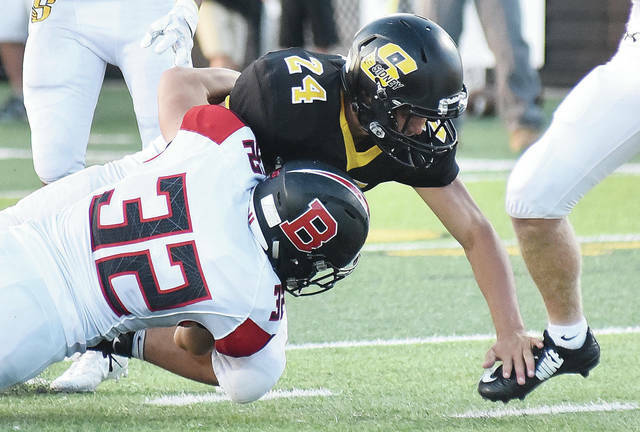 SIDNEY — Caleb Harris had a touchdown called back by a holding penalty while Sidney trailed late in the fourth quarter of a nonconference game against Bellefontaine. He didn’t waste a second opportunity a few plays later. 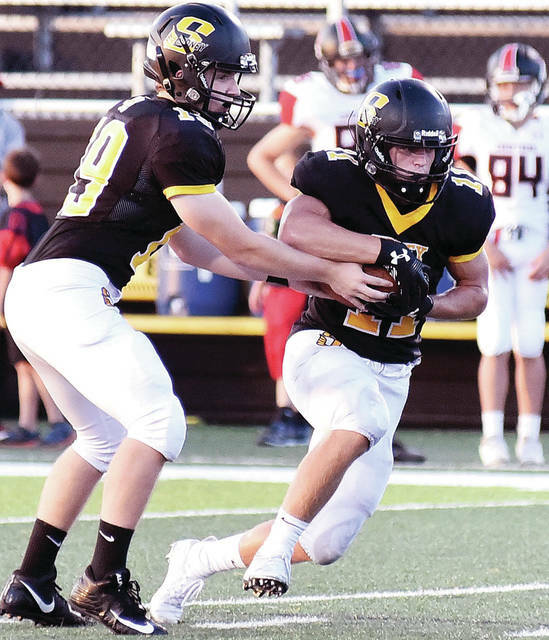 Harris scored on a 4-yard touchdown run with 5:41 left and had another big run on a third down later in the quarter to help the Yellow Jackets earn a 31-28 win over the Chieftains in a televised game on Thursday at Sidney Memorial Stadium. “I didn’t think it was a hold on the first one, but it didn’t matter. We still got in the end zone and got what we wanted,” Harris said. 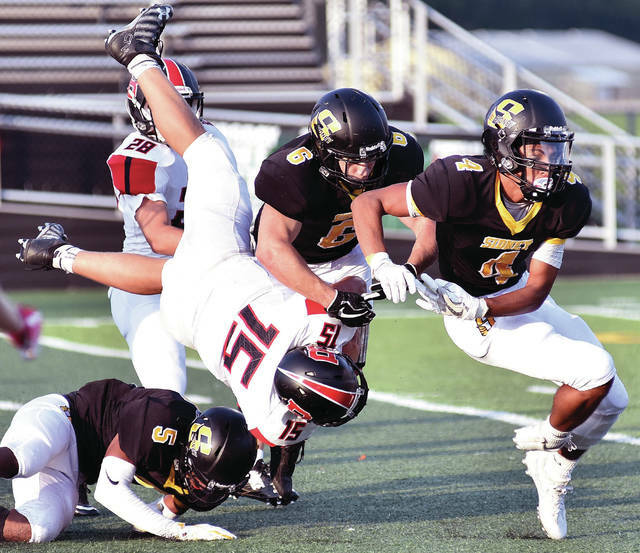 What Sidney wanted and needed was a bounce-back win in front of a television audience after losing a season opener to St. Marys by four touchdowns. The win showcased a vastly improved offense, which racked up 368 yards and 22 first downs without turning the ball over. It’s also the first win for Sidney in the post-Isaiah Bowser, Andre Gordon era. Down by four points, Sidney drove 80 yards in the middle of the fourth quarter to take the lead. 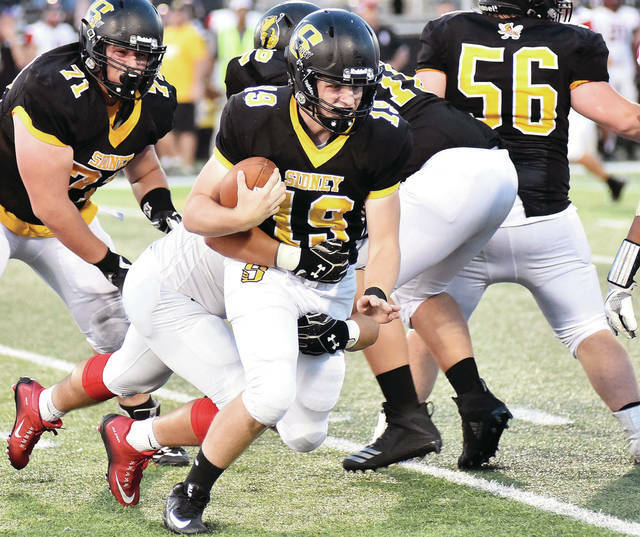 Harris appeared to score a touchdown with about seven minutes left, but a holding penalty negated the play and moved Sidney back to the 13-yard line. After a few runs by Sidney freshman quarterback EJ Davis and a Bellefontaine facemask penalty, Harris ran it in from four yards out with 5:41 left to put the Yellow Jackets up 31-28. Josh Harlett intercepted a Bellefontaine pass deep in Sidney territory with about 1:40 left. 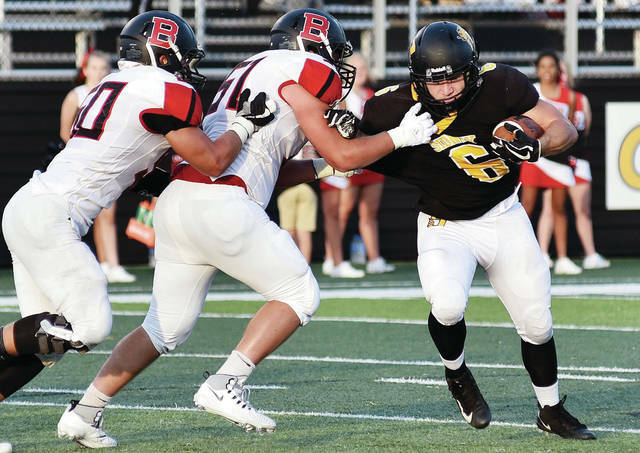 After Bellefontaine used two timeouts and forced Sidney into a third down, Harris ran up the middle 84 yards for a touchdown, which was called back due to a block in the back penalty. Even though the penalty negated the TD, Sidney still had the first down it needed to run out the clock, as Bellefontaine was out of timeouts. Junior starting quarterback Ryan Dunham had three interceptions and one fumble against St. Marys. He had a vastly improved performance on Thursday as he completed 10 of 12 passes for 138 yards and one touchdown with no turnovers. Dunham also split time at quarterback with Davis, who worked his way up the depth chart in preseason. Davis ran for 96 yards on 10 carries with one touchdown and completed 1 of 2 passes for 50 yards. “We put a package in this week for EJ to get him a couple more reps in, and it worked out great,” Harris said. Harris ran for 55 yards on 16 carries and also caught one pass for 15 yards. A starter at defensive back, he also assisted on five tackles. “He’s our dude,” Doenges said. “When you lose some of the weapons like we did, other guys just have to step it up and figure it out. Caleb is our utility knife. He’s going to be running back, he’s going to play slot, he’s going to be safety, he’s going to be moved up on the line, off the line. Sidney led 17-14 at halftime and got the ball to start the second half. The Yellow Jackets drove 70 yards on seven plays, and Davis capped it off with a 23-yard touchdown run with 9:15 left. It was the first career TD for Davis. The Chieftains scored the next two touchdowns to take a four-point lead early in the fourth quarter. On Bellefontaine’s next drive after Davis’ touchdown, several big runs quickly moved the ball deep into Sidney territory. Bellefontaine junior quarterback Grant Smith ran around the right side of the line for a 2-yard score with 5:57 left to close the gap to 24-21. Sidney turned the ball over on downs on its next drive on Bellefontaine’s 13. The Chieftains moved to midfield but faced a third-and-four at their own 44. Garrett Gross ran up the middle on a fourth down conversion try, broke through and ran up the field toward the home sideline. He cut back against a pursuing defensive back near the 5 and went into the end zone on a 56-yard TD run that put Bellefontaine up 28-24 with 10:32 left. Dunham said Bellefontaine’s run didn’t dispel Sidney’s confidence. Bellefontaine opened the game with a 10-play, 65-yard drive which Grant Smith capped off with a 4-yard touchdown run with 7:18 left in the first quarter. The Yellow Jackets responded with an eight-play, 75-yard drive that was capped by a 25-yard touchdown pass from Dunham to Lathan Jones with 4:40 left. 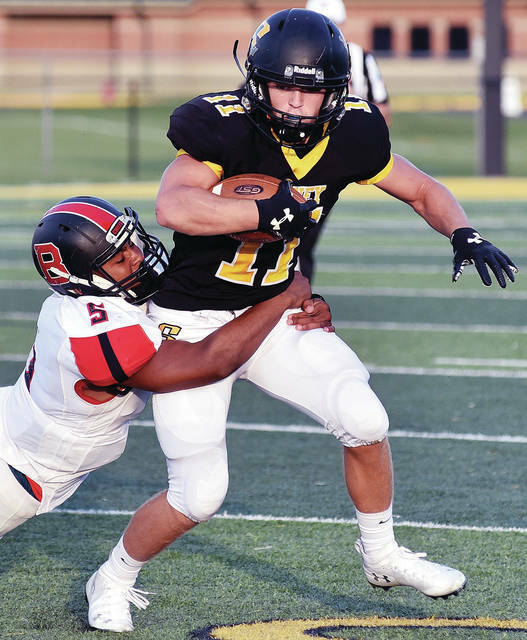 The Yellow Jackets took a 14-7 lead on Bellefontaine’s next drive when senior defensive back Josiah Hudgins stepped in front of a pass on a third down and returned it 41 yards for a touchdown with 3:00 left. The Chieftains tied it 14-14 on the next drive after Smith ran two yards for a touchdown with 9:45 left in the second. Sidney answered on its next drive. Hallie Truesdale made a 20-yard field goal with 4:35 left to put the Yellow Jackets up 17-14. The game was the third time Sidney has been featured on Fox 45’s Thursday Night Lights since 2016. 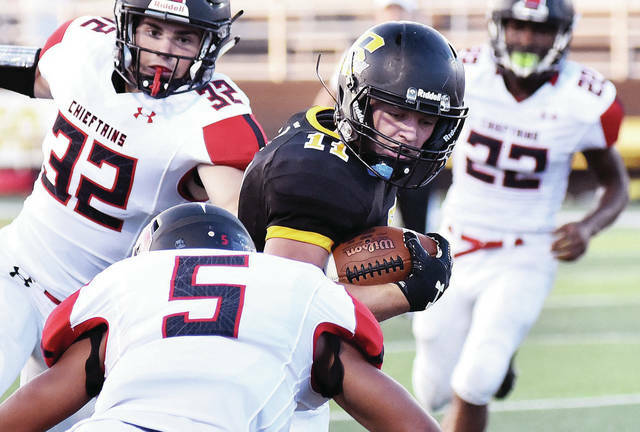 The Yellow Jackets lost to Piqua in 2016 in a televised game and beat Tippecanoe last year. The game will be rebroadcast on Sunday at noon on ABC 22. 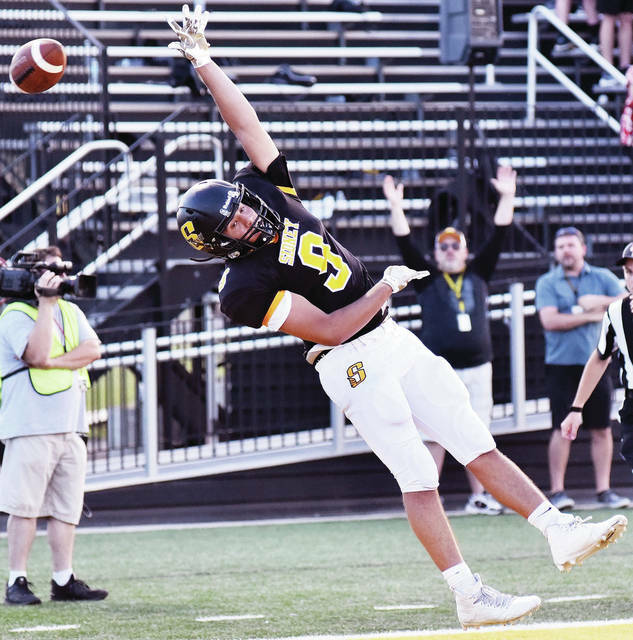 This entry was tagged 45.2, Adam Doenges, Bellefontaine, broadcast, CBC, Central Buckeye Conference, Chieftains, Football, Fox 45, Greater Western Ohio Conference, GWOC, high school, live, MyTV Dayton, Ryan Dunham, Sidney, Thursday Night Lights, Toby Smith, watch, Yellow Jackets. Bookmark the permalink.